I’m falling behind! It’s veggie week already and I’m still posting dishes from the fruit week. I promised you roast pork with apples and turkey with pears and you’ll get them. 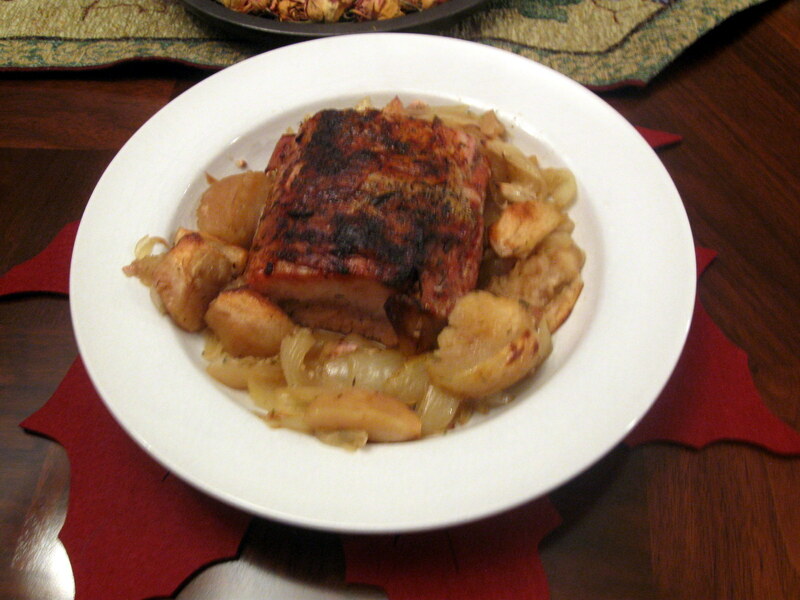 Here’s pork roast with apples. The turkey with pears tomorrow. The actual apples were not anything spectacular to eat at the side but together with the apple juice in the pan they gave magnificent taste to the pork. You can find the recipe at Nigella’s. Here’s how I made it. How to make: Put the pork in a glass container. I used the pyrex that I’d use for cooking. Rub the meat with a little olive oil. Rub salt and pepper to taste. Rub the garlic. Sprinkle the thyme. Arrange the onions and apples around the meat. Cover with cling film and let it stand in the fridge for at least an hour or overnight. When ready to cook, add best quality apple cider or real apple juice, to reach about 1 inch/2.5cm in the pan. Pre-heat the oven at 375F/190C and cook for about an hour or until done. I use a meat thermometer to be sure. Enjoy! It’s really good.